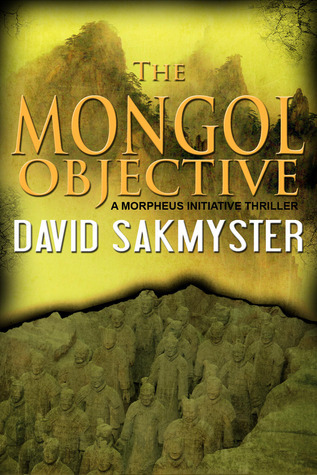 The Mongol Objective is the second book in the Morpheus Initiative series by David Sakmyster. Caleb Crowe is back on an adventure with the Morpheus Initiative, a group of psychic archeologists who travel the world looking for ancient treasures. This time, his sister Phoebe is by his side as they search for a former colleague who has stolen a valuable Egyptian artifact. They travel around the world and find themselves on a quest to locate Genghis Khan's tomb. Like the first book in this series, The Pharos Objective, The Mongol Objective is a thrilling action adventure in the style of Indiana Jones. For some reason, I am drawn to this sort of story. It's fun and exciting, and I had a hard time putting it down. I love the idea of looking for ancient treasures, and Sakmyster puts the reader into the action from cover to cover. He also provides wonderful descriptions of the locations depicted in the book; I have vivid images of giant statues and a winding river weeks after finishing the book. This book was a bit darker than the first book in the series, though, with the death of a main character and several others, as well as the separation of Caleb from his son for much of the book. The relationships among the different characters that were in the previous book are explored much more in The Mongol Objective. I will say I was surprised by some of the actions of certain characters. But overall, it was interesting to get to know them better. If you read The Pharos Objective, I highly recommend The Mongol Objective. If you haven't read the first book in the series yet, don't start with this one. This is a trilogy that you really need to read in order, or it won't make sense. So if you're looking for a fun adventure story, pick up The Pharos Objective, and then move on to The Mongol Objective. This review was written based on a copy of The Mongol Objective that I received from the author in exchange for an honest review.